Ask Anna: Why are specific colors associated with certain holidays? — Anna Akbari, Ph.D. It happens every season: stores and public places redecorate for the upcoming holidays, and their associated color schemes are inescapable. Colors are an important element of the visual cues that help us to define and experience the world around us. You’re probably already familiar with basic color psychology and how it’s put into effect in our daily lives all the time. We’ve already touched on the subject in our coverage of Pantone’s annual ‘color of the year.’ Colors can inform the zeitgeist and define a mood, creating a feedback loop where our experiences ‘color’ our perception of the shade, but our associations with them can also help define our moods. For example, you may have noticed that many social media apps and hospital walls feature different shades of blue. In hospitals, blue is employed specifically because it is widely agreed to have a “calming” effect on the viewer, even lowering the heart rate and physical signs of stress. This calmness is beneficial for tech companies to align their products with – it gives the impression that their product will have a “decluttering” effect on the user’s life and present a clean, easy-to-navigate user experience that will arrange information in a clear way. Similarly, the color psychology of blue has to do with its association with both masculine and corporate qualities in the present day; it projects confidence, rationality, even security. What this means is that colors are inextricably linked to our experience of emotionality in general, and they’re a shortcut to the visual markers that we use to create memories. 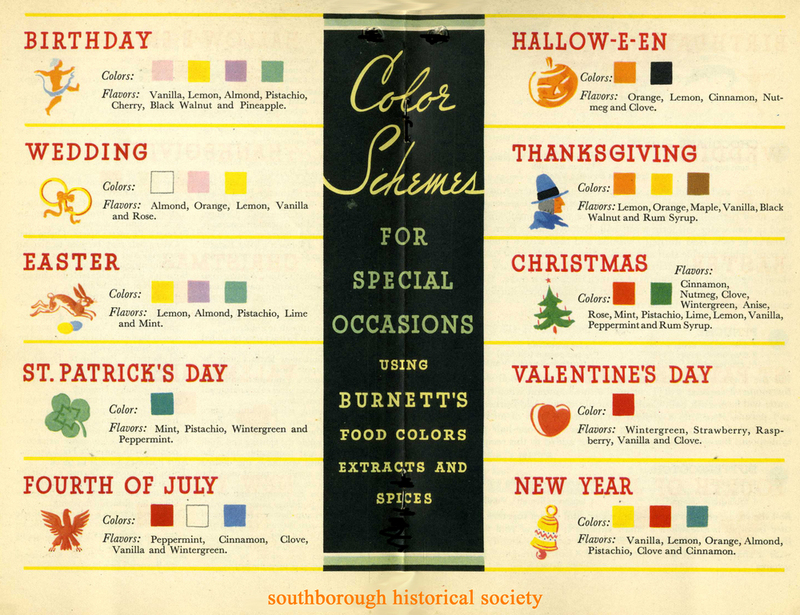 Thus, the color associations we have with certain holidays are often a combination of symbolic relevance and seasonal reflections – not purposefully planned or marketed, but developments that occurred over centuries and now seem to be innately linked. For example, many holidays’ colors are just a reflection of what you see outside your window when you celebrate them – they’re just general seasonal colors. A good example of this is Thanksgiving, which, since its inception, has been a literal harvest celebration: a feast to mark a good harvest. Thus, the colors that represent it are the reds, browns, and oranges of the leaves that mark the turn of the season. Similarly, Halloween is a perfect mix of the seasonal and the symbolic. Its roots are ultimately traced back to two lineages. Initially, it came from Celtic and pagan holidays celebrating the harvest season in relation to “the death of summer.” It began to mingle with the celebration of various holidays honoring dead spirits, such as the interrelated Catholic All Saints’ Day and Mexico’s Dia de Los Muertos (Day of the Dead.) In combination, Halloween is represented by orange – a harvest color – as well as black, the color of death. Christmas colors are associated with a symbolic, religious ceremony that happens to be linked to the seasons. In the Middle Ages, people decorated pine trees – which are evergreen, and thus still visible in winter – with red apples to symbolize the biblical Forbidden Fruit. Eventually, Christmas picked up an association with reds and greens, which later grew to become associated with general good tidings and winter festivity as the holiday began to shed its original, religious symbology. For a holiday that most people conceive of as being a pure marketing tactic, Valentine’s Day actually has very old emotional and symbolic associations. It was originally tied to a Christian day of martyrs – most namely, St. Valentine, who was imprisoned for performing weddings for soldiers who were forbidden to marry. This association of red with martyrdom comes with red’s historic association with blood, violence, and political change. No one is quite sure when it became associated with love, but the logic is pretty clear: as the color of blood, humans are coded to go into stress mode and experience a higher heart rate when they see the color red. What else might you associate with a racing heart? Oh, that’s right, love. In the Middle Ages, the well-known writer Geoffrey Chaucer referenced Valentine’s Day as a romantic holiday, and because his influence was so far-reaching, that association pervaded the culture. So the next time someone tries to wheedle their way out of getting you a Valentine’s Day gift on the basis that it’s just a “Hallmark holiday,” you can tell them that it actually has very far-reaching associations with both bloodshed and the idea of romance.